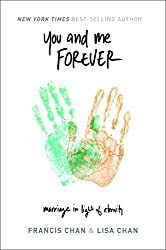 Found this pleasent surprise in my inbox this morning: christianaudio.com are giving away the mp3 audiobook of Francis and Lisa Chan’s book You and Me Forever: Marriage in the Light of Eternity. All they ask is an email address and signup to their newsletter. For those of you who aren’t already aware, The Chans’ new book isn’t your usual Christian, or even ‘Christ-focused’ marriage book. Not that it is not these things. Rather than focusing on marriage, how we can be better spouses and honour God in our love for one another, this book centers on placing our lives and marriages in the context of serving God, with eternity in mind. Full disclosure: My wife and I haven’t started working through the book yet. I have read the first chapter and flicked through the rest – I’m waiting to read it thoroughly until we make the time to plan through it together. My impression is…challenging. Beginning not with the premise of drawing out wisdom from scripture on how to treat our wives with more understanding and our husbands with more respect, it seems the book’s message is that, not to discount those things, but that those things flow out of submission to God, and living our lives, running our families in obedience to Him and placing His priorities above our own, including a comfortable and ‘happy’ house, life, marriage and so on. The image to your left should link you to the free audiobook, offered until February 12th, otherwise click on the link here.